BOISE – You never get a second chance to make a first impression. The newest member of the Spokane Indians made a pretty good one on Saturday. 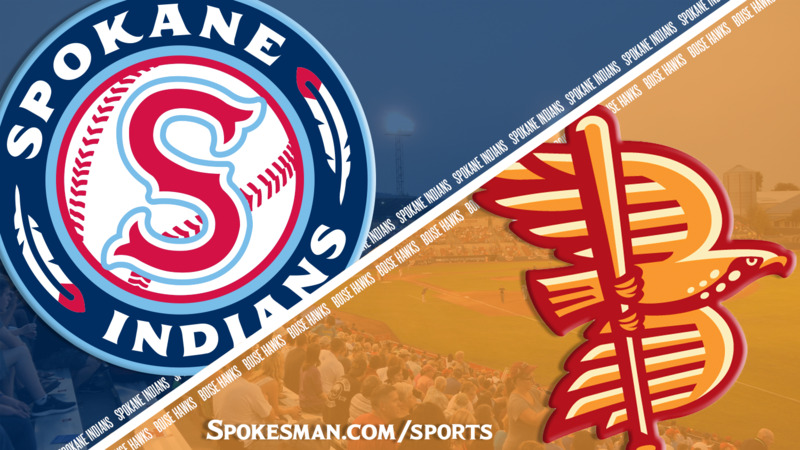 Starter Yerry Rodriguez struck out eight over 6 2/3 innings and the Indians beat the Boise Hawks 7-2 in the third of a five-game Northwest League series at Memorial Stadium. The Indians (9-7) remain one game behind North Division-leading Vancouver. Starling Joesph hit a pair of homers, his eighth and ninth of the season, tying for third in the league. Rodriguez, 20, was called up from the Texas Rangers’ Arizona League affiliate after the all-star break to replace Hans Crouse, who was promoted to Low-A Hickory the same day. In 38 1/3 innings in Arizona, Rodriguez went 2-2 with a 3.52 ERA and 1.07 WHIP with 55 strikeouts against just three walks. The Rangers signed Rodriguez as an international free agent in 2015 and he pitched with the organization’s rookie-level Dominican League team his first two seasons. Against Boise, Rodriguez allowed two runs on eight hits and one walk. He threw 87 pitches, 59 for strikes. The Indians gave Rodriguez something to work with in the first inning. Hasuan Viera and Curtis Terry hit back-to-back one-out singles and Diosbel Arias smacked a two-run triple. He later scored on a groundout by Jax Biggers. Starling Joseph made it 4-0 in the fourth with a solo home run. Boise finally got to Rodriguez in the sixth. Kennard McDowell lined a single and Cade Harris launched his fifth homer, a no-doubt shot to right. Rodriguez came back to strike out the side. The Indians made it 6-2 in the seventh. Cristian Inoa was hit by a pitch, went to second on J.P. Martinez’ bouncing single and scored on a sacrifice fly by Viera. Martinez then scored on a wild pitch. Rodriguez left with two down and two on in the seventh, but reliever Austin Pettibone got a ground out to end the threat. Joseph added his second homer of the night, a solo shot, in the eighth. Boise starter Nick Bush left the game with one down in the fifth after injuring his side throwing a pitch to Arias. He allowed four runs on nine hits with no walks. Vancouver 8, Salem-Keizer 5: Yorman Rodriguez went 2 for 5 with a homer, Tanner Kirwer drove in three and the visiting Canadians (9-6) outlasted the Volcanoes (9-6). S-K starter Gregory Santos was struck in the head with a line drive in the first inning and left on a stretcher. Everett 7, Eugene 0: Cal Raleigh hit a three-run home run and the AquaSox (9-7) beat the visiting Emeralds (7-9). Everett starter Orlando Razo gave up one hit and three walks over six innings. Robinson Cano played third base and went 0 for 3 with a run and a walk in his MLB rehab assignment. Tri-City 4, Hillsboro 1: Michael Curry hit a bases-clearing double in the eighth inning and the Dust Devils (6-10)topped the visiting Hops (9-7). T-C starter Angel Acevedo allowed one run on two hits and no walks over six innings. Published: Aug. 11, 2018, 9:19 p.m. Updated: Aug. 11, 2018, 10:25 p.m.